The post-exilic Jews needed a reminder of who their God was and how He worked. History provided the best lesson for them. 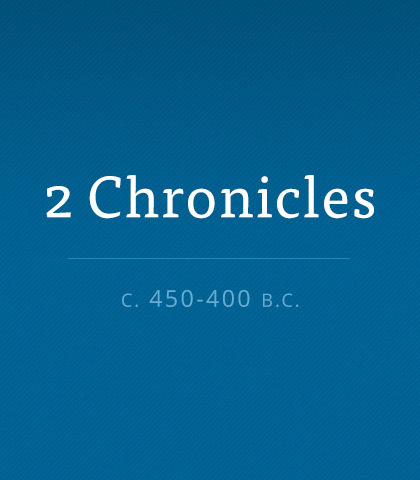 Read more about the book of Second Chronicles. Our belief or disbelief in God adds nothing to nor takes anything away from His glory, any more than our sight or hearing commands the sun and the birds. But if we were suddenly struck by disobedience and self-conceit to steal God's glory, even then He would remain undiminished. God's glory is His and His alone, and with no other does He share it. Tragically, King Uzziah didn’t learn well enough what it meant to fear and worship God. He had a good start. He walked humbly with God, pursued the disciplines of godly living, and sought wise counsel. But when he achieved military prowess and gained notoriety, his heart became proud. He built monuments to himself. Then his fear of God waned, and he sinned against Him. And Uzziah’s sin had lifelong consequences. How tempting it is to claim the credit ourselves for the mighty works God does in and around us. Perhaps no one feels that temptation more than those who serve God in a public ministry—those who have been called to hold His glory in sacred trust. Whether their work becomes a movement of God or calcifies into a monument to themselves depends on one crucial factor: who gets the glory.